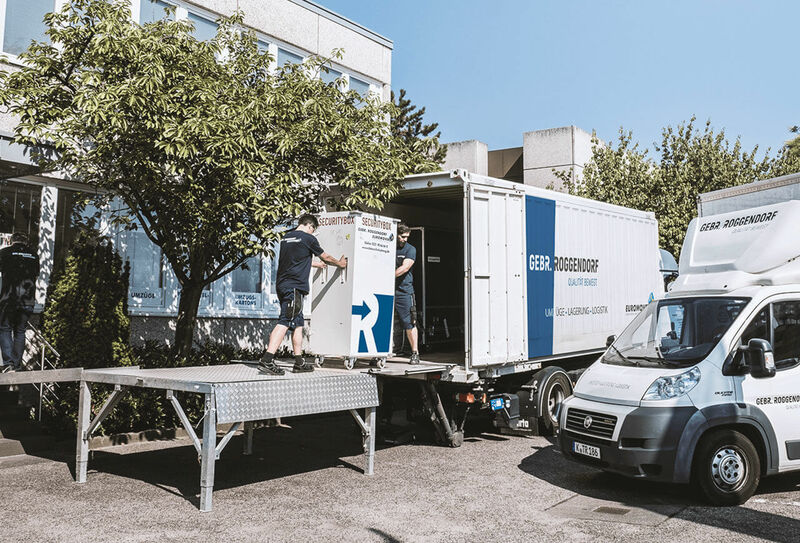 Data protection transport | Roggendorf – Quality moves. Failing to deal responsibly with sensitive customer data can have dire consequences for companies. When transporting data protection-relevant materials, you need to be vigilant and use the utmost care. After a visit to your premises, we will create a project plan tailored to your requirements. We will give you an overview, accurately documenting all security risks and their solutions. A single point of contact will coordinate the entire undertaking and is available to answer any questions you may have. We, of course, have the latest technical equipment to do the job and offer versatile, practical methods of transport equipped with various safety devices, such as lockable, wheeled security boxes. With the introduction of modern ramp systems, we have accelerated the loading and unloading process considerably. Our wheeled transport equipment saves up to 30% of time and energy, making your move easier and more affordable. Using individual trolleys allows you to continue working and prevents business being halted.